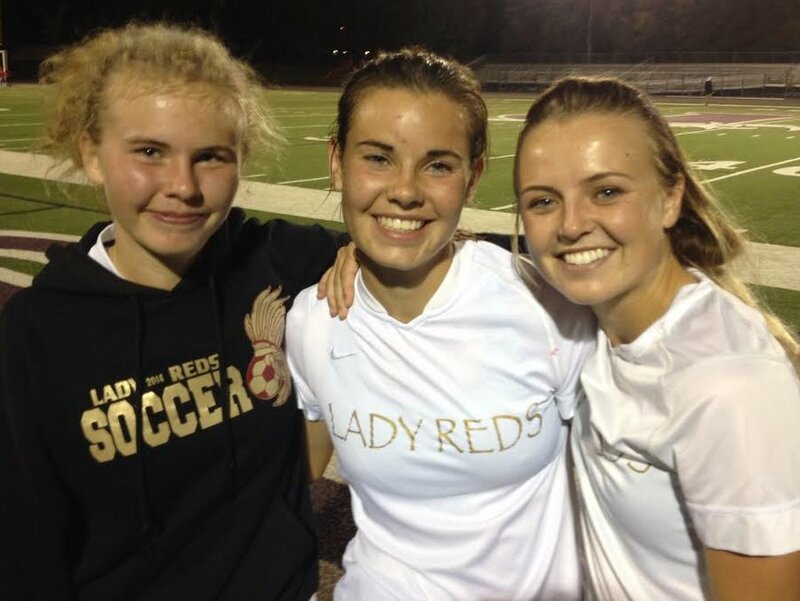 SANDY — Cedar High sisters Ashley and Nicole Jenkins have grown up playing soccer together, and in the state semifinals the lifelong chemistry they have developed helped the Lady Reds earn a berth into the 3A State Championship match with their 1-0 win over Snow Canyon Friday at Jordan High School. Ashley and Nicole’s backyard practice paid off as the duo orchestrated a give-and-go goal that was as pretty as you’ll see at any level. Twenty minutes into the stalemate match, older sister Nicole received a slot pass from midfield that she tapped over to her sister. The Warrior defense bit hard, giving Nicole just enough room as she cut towards the goal. Ashley stuck the ball on her and Nicole raced for the goal. Nicole drove to the right side of the goal and, with a defender hanging on her and the keeper closing in, she lasered the ball far side into the back of the net for a spectacular goal. Younger sister Ashley, who is just a sophomore, said that it all happened so fast, she can’t really remember exactly how it went. With the wisdom of an older sister, senior Nicole chimed in. Cedar head coach Scott Kamachi said the sister combination was absolutely clutch in that moment. After the fantastic goal, Cedar dug in defensively and shut out Snow Canyon for the remainder of the game, avenging a region loss in overtime earlier this year. Senior defender Whitney Yardley said that teamwork with her defense and direction from goalkeeper Megan Giddings helped the Lady Reds pitch a shutout. Snow Canyon came close to scoring several times, but ultimately came up short. One near-goal happened in the 61st minute when Giddings dove, but bobbled a shot for the bottom left corner. The ball slipped out of her hands and hit the post before she stopped the momentum of the ball while it was still on the goal line. Cedar improved to 14-5 overall and advances to the 3A state title game for the second straight year. The defending champs battle Logan at 4:30 p.m. at Rio Tinto Stadium. Snow Canyon finishes its season 9-6-4.